Alternative Formats: SVG (491 KB) PNG (823 KB) - JPEG (605 KB). What was the first forum software? What are the ancestors of the popular forum software? ... When phpBB development began? Who developed Simple Machines Forum? You'll find these answers on the forum software timeline above. 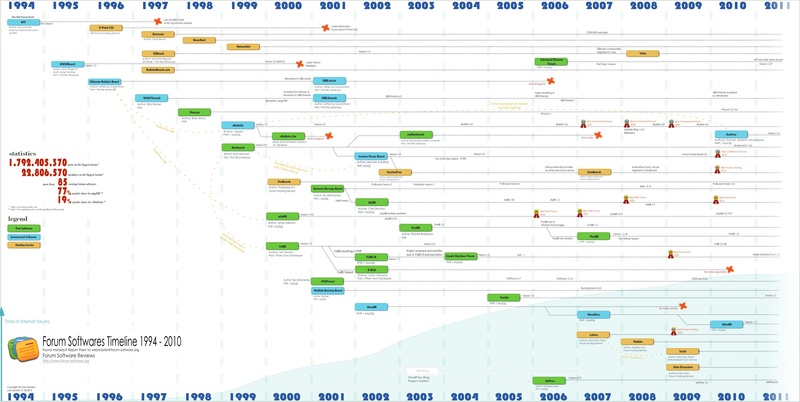 From 1994 to 2012, it describes the history of 18 years of Internet forum software. Please note that this document may contain small errors. If you discover one, please contact us and will do our best to fix it..
That's an awesome work man! That's an awesome work man! This diagram is really complete and was helpful to know more about my favorite SMF! Can I just say what a relief to discover somebody who genuinely understands what they are talking about on the internet. go for a paid option? There are so many options out there that I'm completely overwhelmed .. Any tips? Many thanks! І've eaten a few excellent BBQ created by cooking a entire hog applying a chicken wire framed up with metal rods and then perched on top of concrete blocks. The grill size of 650sq inches is clad in stainless steel grates providing years and years of grilling service. The threat that happens with running a barbeque grill is needless to say, fire. Remarkable information you have got here. Truth be told, I've been hunting for such a information for a long time. Not anyone has covered it like you have. Could there be more? Sure, but you told me what I needed to know and no person likes information overload. Hi there to every single one, it's really a pleasant for me to pay a quick visit this web site, it includes helpful Information. stuff previous to and you're simply extremely wonderful. I really like what you have received here, certainly like what you are saying and the way through which you assert it. You make it entertaining and you still take care of to stay it smart. I cant wait to read far more from you. That is actually a wonderful website. I do not even know the way I ended up right here, however I assumed this submit was once good. Uiwaoni Bali Mojo uetegmayu aogoitu. Looks great. Please add XenForo, from the former developers of Jelsoft / vbulletin. With a great pleasure, but have you already released a public version, and can you give us more details about XenForo? We would be really happy to review it here! We have not yet made XenForo to download available outside of private testing, but our community forums have been running on XenForo since they were launched on July 29th. You can get a good idea of the way things fit together from a user perspective right now by visiting http://xenforo.com/community. We expect to make our initial public release in the coming weeks. Yes, indeed, this forum looks very nice. I'll however wait for an initial release before reviewing it, if you don't mind. Anyway, I've added XenForo to the list of next reviews. Good luck for the first release then! The very first hosted forum service I know of was X-Point CGI back in 1996. This was followed by InsideTheWeb.com, Server.com, BeSeen.com, and Bravenet.com in 1997. Boardhost started up in 1998 and Network54 and EZBoard launched in 1999. I'm not certain about BulletinBoards.com. According to the whois database, the domain was registered in December of '97 and Archive.org doesn't have anything for them until 12/98. As far as software goes, the very first web forum software was WIT back in 1994 (http://www.w3.org/WIT/). The most popular software back in the early days was WWWBoard from Matt's Script Archive. It was released in 1995. Very interesting, I'll update the timeline according to your post. 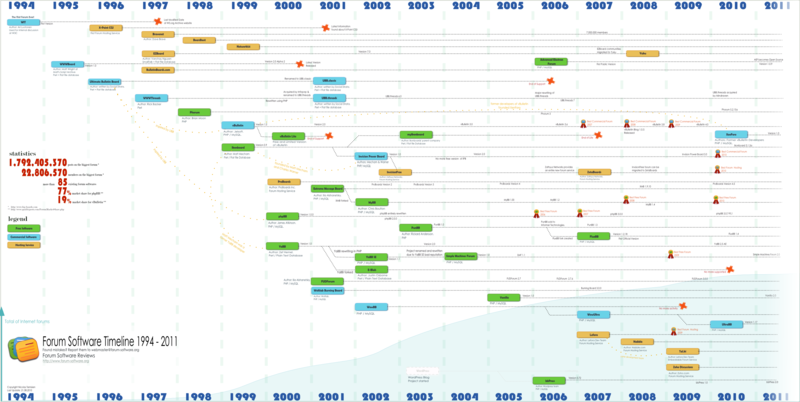 Timeline updated, it now goes back even earlier: in 1994, with the first forum software ever: WIT, developed by W3 consortium. Some of the interrelations between a few forum suites we have worked with over the years I didn't know. Proboards should be listed here. It has been around since January 1, 2011. On June 11, 2002, ProBoards Version 2 was launched, followed by version 3 in February 2003, then version 4 on April 30, 2005, and now the current release is version 4.5. Thanks, ProBoards is now on the timeline. ^ Sorry, that should say January 1, 2000. Proboards was first launched on January 1, 2000. Thanks for putting the chart together, very informative ! mind adding it please ? I noticed this too, and the recent update of the timeline now integrates AEF. Do not hesitate to promote this infographic on AEF website too! The lines at the top between 2003 and 2004 look messed up like the lines aren't even connected..? Finally, I found the problem... I was using my browser cache's version, that's why I didn't understand what you were talking about. It's fine now, thanks. Ikonboard 3.2 is yet to be publicly released, though already has a notable history. Originally development began in late April 2003, however work on this release stalled, and development made later became part of iB 3.1.3. Then development on this release was restarted on February 10, 2006 by 'The Ikonboard Team', however they departed on September 10, 2006 taking their work with them to IkonForums. On January 8, 2008 the (former) official German support site 'ikonboard.de - Reloaded' completed its transition in converting to IkonForums, though still provided support for Ikonboard. I'm running Discus from Discusware. It was pretty good in it's heyday, but, alas, like many on your great list, it's gone. I started using it in 2000 on my site but it was around a few years before that. Please feel free to add its timeline! Tx. Can I be cheeky? What software did you use to draw up your timeline? It is excellent!!! One thing I'm kinda missing in there is Woltlab Burning Board Lite. Burning Board (the normal version) 1.0, 1.1 and 1.2 were free. On March 23rd 2002, they released Burning Board 2.0 which was a complete rewrite with focus on usability. Due to the development effort, Woltlab decided to charge money for it, while the "old" 1.x versions were still available for free ("sort of lite version") and still being developed to some extent (Version 1.2 was from November 2002, i.e. 7 months after the release of 2. In July 2004, they released Burning Board 2.2 and simultaneously, the very first free lite version (1. which was a stripped down version of the regular Burning Board 2.x, replacing the ancient free Burning Board 1.2. WBB version 4.0 is said to be released in 2012, but there's no specific date yet. Codename is "Dragon"
PS: most of the info and dates are from the German Wikipedia entry for the WBB. I just saved you some time and trouble with crappy google translations Link to the article below. Its amazing how far its come, and that pic has put it all into perspective. This is a great piece of work. Very professional! Where would you say commercial and enterprise class solutions (like GetSatisfaction, Lithium, Jive) fit in this excellent chart? Also facebook is all over the news with 1 billion members, how many members would you say online forums have, globally? Is there any data on this? This is a very impressive piece of work! Would love to hear your perspective on these. If you want to compare this with vBulletin you need to have a good English support forum and improve the translation, because it's rubbish. Love seeing stuff like this and how the market evolves over time. And we have a site running it that's going viral right now. You can reach me at discussionsquare@gmail.com if you are interested in the platform for your site or for a standalone project. One stat I've been digging for is how does aggregate discussion board use compare to facebook. If anyone knows of that stat, please post here. Discussion is bigger than I think most expect. Would be nice to see an update. MyBB already is at 1.6.9 and 1.6 hasn't been mentioned yet in the picture above. Ouf re Taki teliewsa kai m'auto. How come this was last updated in 2011??? Thanking you for helping us to choose best forum software by features, review and user ratings. I created my new forum with mybb after comparing at forum-software.org. Visit.